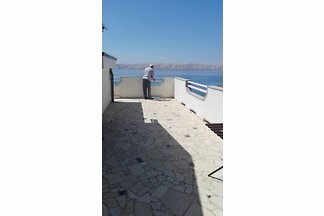 An apartment for 2-4 guests with great views of the nearby sea. For the first bay is a staircase leading from the house. Parking, bed linen, towels, Wifi are included. A functional apartment between the mountains and the sea, with a view to the sea and mountains. Until the first turquoise bay simply running down from the house. from 5 4 holiday homes & accommodations in Karlobag were rated with an average of 4.7 out of 5 stars ! Rent successfully your holiday flat or holiday home in Karlobag in only 20 minutes !